Is the 1:st book of the Torah, the Genesis = The Beginning, a mathematical code for our physical universe? “This isn’t a jealous God of a petty people who says, ‘My God is bigger and better than your God because it’s my God and it’s the one God because I say so’. That’s not what we are saying here. I’m saying that we are starting with a definition of singularity and wholeness. Definitions are not the basis of prejudice. It’s a postulate. Putting it down to see how good it is. Does it give us anything? And if we look for the means of spanning between the one and the many, we have a path that includes everything in the universe. Now, modern physics attempts a bottom-up reconstruction. To take all the diversity we find, all the forces in the world, and pump the energy up until things merge together and eventually we can extrapolate and find the Big Bang. The one, from the many. Note that if Stan Tenen is right about the Torah as an encoding of ancient truth, and about the Jewish religion as [‘just’] the container for this inner truth, this in no way contradicts my earlier blogging “Something seismic happening“. Though it does give credit to the fundamentalism as a time-container that has now served it’s purpose, and can be pensioned off with a gold a medal for long and faithful service, or something. Have participated in my brother’s research work — Ulf Erlingsson, Geomorphological development of the bottoms off Österlen, southernmost Sweden, UNGI Report Nr 76, Uppsala University Department of Physical Geography, 1990, 136 pages. I am mentioned twice in the report, both as field assistant (p. iii; the diver in the photograph on page 85 is me (depth 36 meters), though no name is mentioned under the image), and also as having “assisted with much valuable advice in the construction of the Sedimeter electronics“, a patented invention of Ulf Erlingsson used in the surveys. (p.iii.) More on these kinds of surveys at http://erlingsson.com/. My “Escape from the Box” started with me (in 1988) entering a deeper box, that of a closed religious thinking. I locked my thinking from the inside, and therefore I now understand how that works to prevent independent information from entering anyone’s closemindedness. I now understand why noone can unlock anyone else’s closemindedness from the outside — only gently invite. The post-9/11 world events in 2002 and 2003 provided the trigger and the environment for my own re-awakening, and later escape from the box of conventional thinking. The hypocracy of the religious organization made me gingerly open my own mind from the inside, for independent information from outside ‘non-approved sources’. I deprogrammed from the closeminded religious thinking and left the religious organization in 2004, as a most important milestone in the process started around September 2002, that led to my eventual deprogramming and escape altogether from the box of conventional thinking. My questioning and extensive personal research and networking started with the questioning of official political reality, but it didn’t stop there or anywhere. I became one of the major Swedish 9/11 conspiracy theoreticians, following my 2005 conclusion that the official 9/11 story was important to defuse. I have made major attempts to get the real story out in Sweden, but with limited success. https://leiferlingsson.wordpress.com/ and at http://leiferlingssonsartiklar.wordpress.com/ . Having soon concluded that the powers that be operate through putting the lid on information flow, I concluded that the most effective method to work for change would be to identify people that would boost eachother if connected, and connect them. This I have been doing for years now. It has also been done for me, of course. It works both ways. One of my contacts [… Edited 2015-05-15: To protect the privacy of some people, tree sentences have here been removed.] I have deep sympathy for the peoples that have gotten in the way of the western imperialistic power game vs. the new eastern bloc along the line South of the old East Bloc, Russia, China, North-Korea. This of course include the old Yugoslavians, Palestinians, Iraqis, Iranians (threat of war), Afghanistans, etc. I do not approve of war. It makes puppets of all of us. I have often and repeatedly expressed my support for the oppressed and my disgust with the western war lies. I also network with those who network with the political opposition to western influence in some countries. Here I should mention my brother Dr. Ulf Erlingsson now living in the United States, who is politically fairly well versed after having been the National Globalizations Issues Coordinator and also the Miami-Dade Coordinator in the Kucinich for President campaign of 2004 (Congressman Dennis J. Kucinich of Cleveland, Ohio). He was also active in the Barack Obama campaign, Google “Barack Obama” “Dr. Ulf Erlingsson” for more on that. It was actually my brother Ulf who in September 2002 provided me with the initial trigger that started my re-awakening and awakening process, see “Metamorphosis Escape from the Box” above. I have a number of close friends with deep personal insights from family background and other connections into how the politics and the world is really run. I understand that “Democracy” as it is practiced today is all too often only a Con-game. But also that with a conscious public it is potentially a very good thing. Tearing apart the “vast tapestry of lies, upon which we feed” requires what Nobel Prize winner in Literature 2005, British playwright Harold Pinter, in the same Nobel Lecture “Art, Truth & Politics” that I just quoted from, describes as an “unflinching, unswerving, fierce intellectual determination, as citizens, to define the real truth of our lives and our societies is a crucial obligation which devolves upon us all.” For this he was labeled a “political idiot.” May we all become “political idiots,” in this world where politics is insane. I am intuitive, and have learnt to trust my intuition. Additionally I have a few very intuitive friends who often provide very interesting leads to follow up. One of my friends have even trained himself into a Remote Viewer, a psychic espionage technique developed by the U.S. military, whereby awareness is non-locally moved in time and place to whatever is of interest. It’s far from 100% accurate, but combined with normal methods for confirmation very useful e.g. to find dead people, etc. I mention this to demonstrate that I am open to the non-local aspects of reality. Having extensively studied the writings of Lt. Col Thomas E. Bearden (retd. ), I also understand theoretically how this can work physically. (Books at http://cheniere.org/ .) I made key quotes from one of Bearden’s shorter books to illustrate the theory, in “All is One“, 2009-04-05, https://leiferlingsson.wordpress.com/2009/04/05/all-is-one/ . Contact: +46 (0)709 14 06 31, +46 (0)8 778 50 38, leif@lege.com. PS: The Hidden Order described above implies what could be re-phrased “God is [still] greatest”. I just wanted to point this out, for the religious among my readers. We are taught to follow the methods and maps that we have been educated with. But that can NEVER give us new knowledge. Only recycled stuff. Possibly we will just repeat the errors of those that went before us. Before knowledge is systematized, it is intuitive. FIRST one goes to the Source — Intuition/Connection to the ‘field’. THEN one seek what confirmation is possible from the most original ordinary sources possible. And one experiments. It is never the map that limit what is possible but rather what is possible that should result in later map-making. Though our culture has this backwards, most of the time. I think this intuitive knowledge is very much related to predation. Just KNOWING. The way you arrive at insights are essential to the result, are the result. My life experiences, like yours and yours and anybody’s, are essential to what I conclude from it all. There is not one among us, who’s life does not have something to add to our collective intelligence. Lucky for me, I have always intuitively understood this, and listened to all kinds of people from all walks of life. Unlucky for our culture, this is not the norm. This blog will be about the fundamental stupidity of our culture, and what to do about it. And how I and others arrived at our conclusions, our way. More will follow. I just awoke, 07:10, from a dream. I had just begun an employment at a company, a company with visions. It was in the a afternoon, and at 14:50 someone tells me that at 15:00 hours there will be a general meeting. I go there. It is the management that is speaking. It is a good speech. He also talks about the situation in the world, and a woman next to me looks shocked to have to hear this at work. The speaker mentions a historical person, a Jesuit, who had corrected earlier misconception in science, and who apparently became a Pope as well. I think in the dream of Pierre Teilhard de Chardin, before I hear that he also was a Pope, mostly because I don’t know about so many other Jesuits that were scientists. The Manager speaking is showing a picture of the latest that the company has become involved in. One can see that it is something red, but one doesn’t really understand what it is. It is a little secret as well. It feels that he perhaps is finished. We are allowed to pose questions. Many hands in the air, mine also — I want to ask what this means for the future. A number of other questioners receives answers to their questions, but no-one has answered my question. A woman powerfully sums up that now with the story about this visionary pope, we can round off the first part of the lecture, and go on. But my hand is still up, and I sit just some meters from the speaker. I get the word. I say that he will perhaps answer my questions in the second part of the lecture, but what I had wanted to ask was what this new meant for the future. The speaker goes to the pulpit, that I hadn’t noticed before. He suddenly excuses himself — perhaps he got an important message — and hastily leaves the auditorium. I have — in the dream there was nothing strange about this — a moisted wiper in my hand. While we wait for him to return I go to the pulpit and start to wipe it really clean and worthy our respected Company Manager, for when he return. I realize that I ought to say something. After all, people are shifting uneasily. I say in the microphone that since the venue is booked and we are gathered, if the speaker doesn’t return, do you want to listen to my thoughts about the future? And there I woke up, and went to the computer to write the dream down. About the translation: Given that this was a dream, where insight is of course transmitted symbolically, I have been very careful to preserve the original Swedish flow of the text in the translation. It is therefore more of a word for word translation than I’d normally do. Woke up with a nightmare, my work-tools where taken away from me — my computer screen and keyboard — which in the dream together with expensive server computer was privately owned, but in the dream this was on a workplace where I as a consultant had my own equipment. Woke up with a nightmare, was travelling in a train, in the last car. Was informed that it would be disconnected, that I was supposed to sit in the other part of the train. Went out. Realized that I must get my bags, did so — don’t know why I in the dream then went in a roundabout way (perhaps past a kiosk or station-hall) to the rest of the train, that by then had started to move. I didn’t catch up, even if there was a platform in the back, if only I had had the strength to catch up. Lacked the stamina, even though the train was accelerating so slowly. Some meters short. In todays horoscope for me in the Metro newspaper it says, western: You have dificulty with getting things to work out as you’d wish. Much will however correct itself. Eastern: The solution may come. The first dream is my Holy Contract — So I understand it. On the other hand, holographically, fractally, my life experience could be a map of the world experience, where the whole world has been on a roundabout instead of making needed changes, and now needing to do globally what I have mapped in my personal life; i.e., a tremendous job of catch-up with the timely changes. Originally published in Swedish, at lege.net. My schoolyears were difficult, due to me being a difficult student who did my own thinking, and therefore I often had a hard time understanding the teaching. (Unfortunately, I then thought the error was in myself, and therefore developed bad self-esteem.) I studied natural science subjects in Swedish High School in a four-year Electricity-Telecom/Natural science curriculum. One day at the end of the 1970:s we read about standing waves, and how they can extinguish each other. This applies to all forms of electromagnetic waves, but if one does it with polarized laser light, one can with one’s own eyes see it happen. In my class it was however only discussed in theory. 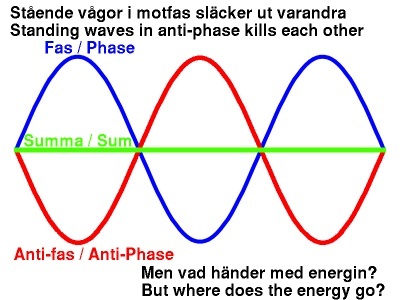 In any case, I asked my teacher where the energy goes, when the waves extinguish each other. I think he mumbled something about it perhaps being used up in the generators of the waves. But he didn’t have a real answer. An experiment with curved space-time but no measurable electromagnetism when two standing waves extinguish each other. The whole of electromagnetism in classical science is a special case at flat space-time, a condition that doesn’t really exist. Classical physics quite correctly state that two [equal but opposite] standing waves extinguish each other – see the illustration. But it has no answer to where the energy goes. My High School teacher was uncomfortable, and answered avoidingly. Thomas E. Bearden says (“Fer de Lance” pp. 229-230 (2002 edition)) that it curves space-time, creates mass and gravitation, etc. Cool. :) Physically, a standing gravitational wave is created, where the energy is pulsating according to the sum of the absolute values of the two extinguished standing waves. Which is an example of scalar resonance. Because where the resulting standing gravitational wave is, there is also mass and inertia as a result of the two space-time curvings from the two extinguished waves. Perhaps I’ll now loose some of those readers who’ve come this far, when I speculate that there must be some deeper reason behind this fantastic obliviousness to the obvious, for more than a century. In Crisis of Imagination (2007-12-05) I wrote that “Our present societal system has a compelling reason for not allowing science and technology or healing science that builds on life principles and creation forces, namely the defense of its very existence”, etc. But the more I have pondered, the deeper I sense that it may be. Now it becomes pure speculation, but suppose this our Earth is a cosmic experiment in limitation — so that we as eternal spiritual creatures here in the physical will have an opportunity to experience fear, in order to be able to get a really wild kick! The Earth as A Cosmic Horror Movie! :) Then the extreme resistance against ‘destroying the horror show’ that is energy crisis, claimed climate crisis, environmental pollution, war, etc. would no longer be so completely incomprehensible. As said, this is speculation on my part, but I haven’t been able to find any other explanation. And if it’s not to mess with the Horror Movie that we are in, that man loves the lies and hates the truth, then I think enough is enough already! “What few people know or even want to know, is that many ingenious inventions, both in the fields of energy and in medicine, has — with pure mafia-methods — been repressed and stopped from being used by them who make their fortunes on the old and harmful methods. Among countless examples that could be presented, I here just want to mention one single typical case. Edwin V. Gray from Los Angeles in the USA invented a magnetically powered electrical motor which, following a battery start, itself produce enough energy to continue to run efficiently, in principle for ever, without further addition of energy. Gray was nominated to ‘Inventor of the Year’ by the Los Angeles Patent Attorney’s Association. Several prominent PhD:s of Technology praised the invention and one of them explained that it was a revolutionary and unique achievement. The Gray motor would — as far as I have understood — be able to be used for the propulsion of cars and other transport systems. It requires no fuel and it emits no exhaust or other pollution. In July 1974 the Los Angeles District Attorney raided the Gray premises, confiscated his prototype, drawings and research notes and charged him on a number of accounts on false grounds. Gray’s lawyers tried everything in order to retrieve his confiscated possessions, to no avail. Through forcing Gray to astronomical legal fees, and trough preventing him from all further manufacturing, they brought him into bankruptcy and prevented his invention from being used. The Gray case is far from the only one. There are dozens of similar cases just in the USA, both in energy and in medicine. Sad to say, I think that professor Jerndal grossly overrated Sweden’s independence. But what can be done with the Internet, that is up to YOU, dear reader! TILLÄGG, 2008-07-17: Läs även mitt inlägg på mediekritik-forumet, där [myten om] CO2-orsakad global uppvärmning diskuterats: Paradigmkampen – Med koppling till myten om CO2-orsakad global uppvärmning. TILLÄGG, 2008-07-18: Menar jag att tiden inte skulle vara linjär? E20090531 Entering the bio-suit ?